This classic recreation offers precision craftsmanship. The 36 in. blade is adorned with intricate designs. The cast metal pommel and guard are finished in antique gold and feature the Star of David and Ark of the Covenant symbols. The grip features sleek black spacers surrounded by cast metal engravings. 47 in. overall. Includes wood wall display stand. I have bought two of these swords. One hangs in the church library and the other I gave as a gift to a friend. I did a bit of research on the sword of Solomon and it seems that there wasn't an actual sword by that name. But this is a wonderful representation of what he may have had. Both swords were well made and look great on display. My only question is why some many reviewers say that they got their products in a matter of days and I always have to wait two weeks when I order something. Is Colorado that far away? An excellent sword, very ornate and beautiful. A wonderful addition to our collection. Got here fast as well. We will be returning for sure for other swords. Hello everyone,I wanted to take the time to let you know first off that true swords sells the best swords out there. The king Salomon Sword I have owned for about eight years and is still in the same shape as the day I got it.It is a huge sword a heavy sword and has a lot of detail in it.The sword was made in pakastan.The detail in the very end of the handle with the ark of the covern is very cool and on the other side with the candles is also cool. I bought other nice swords also all high quality rest assured! sword came with actual sword piece off center, paint chipping off and with a dent on the side as if it was previously used! The sword is very nice and huge! I wish you guys had a sheath for it though, I love the sheath that comes with the dagger version. The sword is beautiful with no flaws. It mounted easily and looks great. It is larger than I expected. I do wonder if the sword type is correct with the period in which Solomon lived. It has a Crusader appearance not the shorter sword used during the 1000 BC times. The set, including the dagger, is a real eye-catcher and conversation piece. It is well worth the money. A friend of mine bought this sword for me as a birthday present. 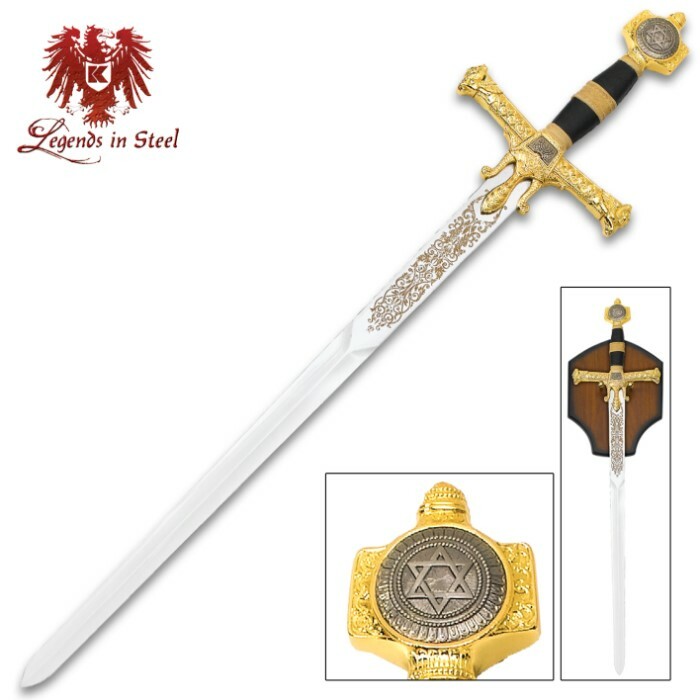 I had the King Solomon dagger (short sword), and this one compliments nicely. The pommel need to be tightened, and the black leather (plastic) around the handle needed to be re-glued. The blade is not as sharpened, and it has a fairly sharp point at the end of the blade. Nice pommel design of the Star Of David, and nice detailed work on the hand guard. The wooden plaque looks like their are no holes drilled in it, however, there are three holes under the covering of the fake wood grain. Despite the few minor defects, I like it. It makes for a nice display piece. It is harder to find them these days, and the price has gone up by $20 since they first came out. Get one today while they are still available.